Too Big To Fail ! Roosevelt Raceway was to harness racing, what Long Island neighbor Belmont Park was to thoroughbred racing, both located in affluent areas, they were the biggest and best tracks in their industries. Roosevelt Raceway boasted of a five story grandstand, that had a capacity of 50,000 plus with regular crowds of twenty to thirty thousand. The campus for Roosevelt Raceway spanned 300 acres and actually had a main road, Ellison Avenue running thru the middle of it. On the west side sat the grandstand and half mile racing oval. The grandstand had a capacity of over 40,000 which included seating for 8,500. The clubhouse capacity was roughly 10,500, with seating for around 3,000. The facility had three restaurants, the clubhouse Cloud Casino which sat 1,600. The Promenade Cafe, which had seating for 650 and the grandstand cafeteria with seating for another 400 diners. The east side, was the horseman area, this was where 940 stalls were located for the horses. This area also included an identical twin of the main track for training and another half mile jogging track. Over all at the facility there was parking for 14,000 cars. For those who lament the loss of Roosevelt Raceway, just think of what it would look like today, with luckily 2,000 people on hand for live racing. The place would be unmaintainable and probably have more plywood blocking rooms off than all the Home Depots and Lowe's on Long Island. A place like that was not meant for todays world, no matter how spectacular it once was. Roosevelt Way, Trotting Lane, Pacing Way are the only reminders of Roosevelt Raceway today and you probably need to live at Meadowbrook Pointe (that's how it's spelled, get the point) to access them. The old track was finally converted to luxury condos. For the rest of us we can go to Lowe's located in an old parking lot and get some plywood. Roosevelt Raceway once known as the "Taj Mahal" of harness racing died a horrific death in 1988, dying filthy and broken a shell of her former self. Starting out as a modest venture in 1940 the track struggled until 1946 when the founder George Morton Levy perfected the mobile starting gate. From that point fans couldn't get enough of Roosevelt Racing and in 1956 a renovation produced "The Dream Track". In 1960 Roosevelt peaked when 54,861 fans turned out for the second running of the Roosevelt International Trot. Roosevelt Raceway was one of the first tracks to introduce a new exotic wager called the Twin Double, little did they know it could be deadly. The twin double was meant to produce huge payoffs and heart pounding action, that it did. In October of 1963 an elderly fan was filling out IRS paperwork for a $1,683 hit when he suffered a heart attack and died at the cashiers window. A month later a spill in the second half of the twin double produced only two finishers in the race. The track made the race official and about 500 fans went crazy, storming the infield and judges stand. The head of security overwhelmed by all of this also suffered a heart attack and died. Despite a few isolated instances Roosevelt provided harness fans with the highest quality racing in it's day races like the Messenger Stakes, the first leg in the harness triple crown and the aforementioned International Trot that brought together the best of the worlds horses. around 1971 civilization was closing in on Roosevelt Raceway it was getting local competition, but many claim the advent of OTB (off track betting) was what finally did the track in. In 1984 the track was sold to a new group of owners, with the stipulation that the site could only be used for racing. Four years later when that group said they were closing Roosevelt Raceway a furor erupted. Law suits were flying, people were dragged through the mud, but in the end Roosevelt was doomed. This was probably for the best, if you look at todays new harness plants like Plainridge or Running Aces a thousand people would look like a crowd, at Roosevelt it would look like nobody was there. So in the end it wasn't that it was to big to fail, it was to big to survive. To put it in perspective for you thoroughbred fans, what if NYRA said it was closing Belmont Park back in 1988! 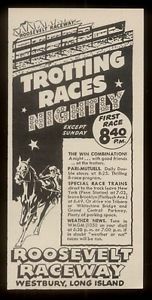 I will always regret the fact that I never made it to Roosevelt Raceway, but I do remember watching harness racing on Saturday on TV hosted by Stan Bergstein that had a feature race from Yonkers or Roosevelt. When the racing was at Roosevelt they would always show a view of the entrance, it seemed like quite the place.